Sally Haslanger, Professor from MIT, shares her skepticism with the audience regarding the use of Saudi money and the positive impact that MIT claims it can have on the community. She stresses her dissatisfaction with what she perceives as the "plutocracy" that has developed at MIT and Harvard. 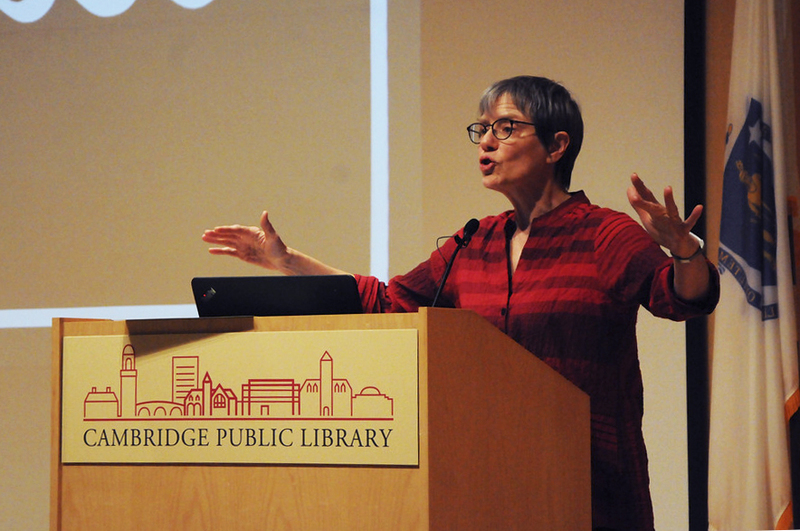 Roughly 100 Cambridge residents — including several Harvard and MIT affiliates — gathered at the Cambridge Public Library Wednesday to call on local universities to be transparent about their partnerships with financial backers in a night filled with speeches and song. Several former and current students from Harvard, MIT, and Boston College organized the event — entitled “Whose University is This?” — following a 2018 visit from the Saudi Crown Prince Mohammad Bin Salman to both MIT and Harvard. The schools’ invitation at the time provoked intense criticism from MIT students. Harvard’s history with the Saudi royal family includes large donations for professorships and programs across several of its schools. After the October 2018 death of Washington Post journalist Jamal Khashoggi at the hands of Saudi citizens affiliated with Prince Mohammad, Harvard and MIT have faced criticism for their relationships with Saudi Arabia and its heir apparent. When Prince Mohammad visited Harvard in March 2018, the University remained mum, offering no public events or press releases about the event. In a release about his visit, the Saudi government boasted about “strong ties” to American universities, including Harvard. Organizer Caitlyn Olson, a Ph.D. student in the Graduate School of Arts and Sciences, said the response to the Crown Prince’s visit was “symptomatic” of how university administrators secretly set their priorities and make high-level decisions. “One of our main concerns is that those priorities are... made behind closed doors in the name of the broader university community, in the name of faculty and students, but without any input from any of us,” Olson said in an interview before the event. Twenty-five speakers took the stage at the event, many of whom discussed Saudi Arabia’s attacks on Yemen and their disdain for Harvard and other local schools’ continued partnership with the kingdom. “Yemen used to seem so far away, but we’re finding out it’s very, very close,” speaker Paul Shannon, part of the Raytheon Anti-War Campaign, said at the event. Raytheon is a major U.S. defense contractor. Another speaker, co-organizer and former Boston College graduate student Ryan Costello, suggested that Harvard and other schools should “pay reparations” and offer scholarships to Yemeni people because of the universities’ ties to the Saudi government. The proposal elicited enthusiastic applause from the audience. The Yemen Civil War began in 2011 after an Arab Spring uprising that ousted its authoritarian president, Ali Abdullah Saleh, and thrust the nation into years of unrest and humanitarian crisis. In 2015, the Saudi government launched a military intervention into the country in support of the current pro-Saudi president of Yemen, leading a bombing campaign targeted at rebels and civilians. The event also featured a “musical interlude” from MIT Professor Ruth Perry who sang a re-written version of “Which Side Are You On?” — a song originally penned for the United Mine Workers of Harlan County, Kentucky in 1931. Many attendees sang along with the chorus. “Our sacred halls of learning / our research and our skills / are subsidized by corporate greed / they pay the research bills,” Perry sang. University spokesperson Jonathan L. Swain did not offer comment for this story. Yarden Katz, an event organizer and a fellow at Harvard Medical School, said in an interview that the event provided an “alternative” to the direction that universities are taking in relation to some of its biggest donors and corporate partnerships. "There's a growing discontent with the ways universities operate and a growing realization that universities are working for corporations, for rich donors, for serving U.S. imperial interests, all at the expense of people and of the broader community around universities,” Katz said. Olson noted that the organizers are ultimately calling for “fundamental” and “structural” shifts in how university administrations involve their affiliates’ perspectives in decisions about accepting gifts. “It is just very much not about just getting another person seated at the decision-making table that already exists,” Olson said. “This is about re-thinking on a far more structural level how decisions are made and these things happen."